Developers Highgrove Group, together with the agents marketing the development – Ashley Smith and Colliers International alongside representatives from Gateshead Borough Council recently met on site to review progress across the development. In particular to review completion of the preparatory and infrastructure works on plot B which is now available to receive potential occupiers. Plot B – which extends to approximately 27 acres has been flexibly designed to accommodate B8 logistics/warehouse buildings or B2 Manufacturing in a variety of sizes ranging from two single units of 200,000 and 220,000 sq. ft respectively or one building of 492,500 sq. ft (with the possibility of further expansion). All three units feature a high-bay specification offering upto 28M haunch height together with 50 K/N floor loading and 50M wide service yards. “We are very pleased with how quickly works have progressed on site and the contractors GMI Construction have done an exceptional job in such a short amount of time. Plot B is now immediately ready for development offering a range of flexibly sized units from 200,000 sq ft upto 492,000 sq ft in a single building. Works on plot A are also progressing ahead of schedule and expected to be complete by the end of the year. Plot A has been flexibly designed to accommodate single sized units from 792,000 sq ft upto 2 million sq ft. Follingsby Max represents one of the largest and best located industrial/distribution developments throughout the North East with a great deal of interest already been shown in the development. The scale of the development plateaus, coupled with the 28m building height consent, offer an unrivalled range of immediately deliverable industrial and logistics development opportunities”. 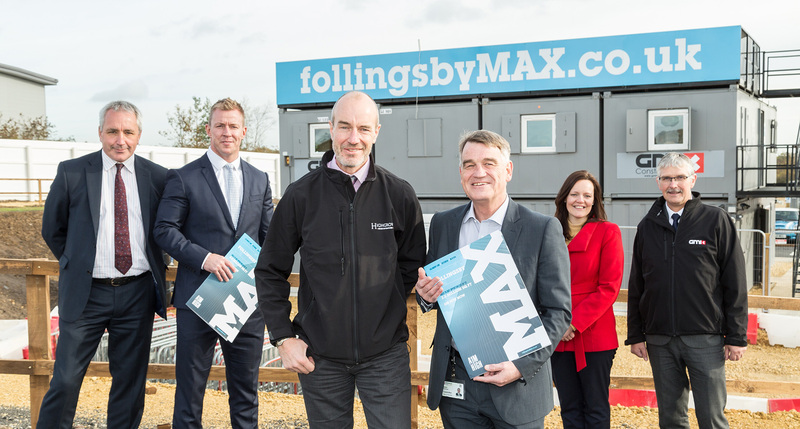 “Follingsby Max will help to address a shortage of high quality, motorway connected industrial and logistics schemes in the North East. The scheme sits at the heart of Tyne and Wear, making it the perfect location for businesses looking for a readily available and productive workforce. Coupled with the location and excellent labour supply is a flexible planning consent and a significant, immediately available, power supply to site. Highgrove’s commitment to service the site is already generating a great deal of interest from a selection of regional, national and international occupiers. We are now actively marketing the development and look forward to speaking further with prospective occupiers”. ‘Follingsby Max’, sits directly adjacent to Follingsby Park – the North East’s most prominent and successful industrial/distribution park development. It benefits from excellent access to the strategic road network, with direct access to the A194(M) providing fast connections to the A1(M), the A19 and north with good access to Newcastle, Gateshead, Sunderland and South Tyneside. The scheme is ideally placed to support the region’s growth in key sectors, cementing its reputation as the premier distribution park in the North East.